Kirti Chakra, the second highest peacetime gallantry award, was posthumously conferred on Lance Havildar Prem Bahadur Resmi Magar of Gorkha Rifles by President Pranab Mukherjee at the defence investiture ceremony in the Capital on Thursday. The late Lance Havildar eliminated four terrorists during an operation in Jammu and Kashmir on June 16 last year. Mr. Mukherjee also presented 13 Shaurya Chakras, of which four were posthumous, and 45 Distinguished Service medals. These include 15 Param Vishisht Seva Medals, two Uttam Yudh Seva Medals and 28 Ati Vishisht Seva Medals. 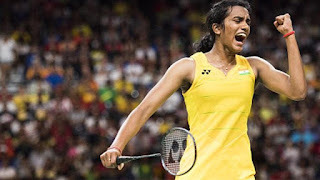 Rio Olympics silver medallist P V Sindhu (21) jumped three places to achieve a career-best world number two ranking in the latest Badminton World Federation (BWF) rankings by earning 75759 points. With this, she became only the second Indian woman after Saina Nehwal to break into the top-five of the world rankings. Sindhu recently had won the India Open title after defeating Carolina Marin of Spain. Saina Nehwal was placed at ninth position in the ranking table with 64279 points. None of the male Indian shuttler figured in the top-10 list, Ajay Jairam placed at 20th place . The Rajya Sabha passed four Bills of the GST, the deadline for which is July 1, same was passed in Lok Sabha on March 29. One more piece of legislation, the State GST Bill, will have to be passed by the legislative assemblies of States and Union Territories with legislature. The passage of the Central GST Bill, Integrated GST Bill, GST Compensation Bill, and the Union Territory GST Bills followed a two-day debate in the Rajya Sabha. “The GST is the collective property of the country in which States, political parties and successive governments have taken part,” Finance Minister Arun Jaitley said in his statement. Last month, while speaking in the Lok Sabha, Mr. Jaitley had said that the consequences of not acting on the GST Council’s recommendations would render the implementation of GST very difficult if not impossible. The Finance Minister, during his speech in the Upper House on Thursday, also explained the need for multiple rates in the GST structure since luxury items and items of public good and necessities cannot be taxed under the same rate. The Reserve Bank of India (RBI) has appointed Malvika Sinha as new Executive Director (ED) following the appointment of B P Kanungo as Deputy Governor. In her new role, she will look after foreign exchange department, internal debt management wing and department of government and bank accounts. Prior to her elevation, she was Principal Chief General Manager, Department of Cooperative Banking Supervision in the RBI. She had had joined RBI in 1982 and as a career central banker she had served in the areas of regulation and supervision, foreign exchange and government and bank accounts. North Korea is ready to deliver the “most ruthless blow” if provoked by the United States, its ambassador to Moscow said Thursday, after President Donald Trump pledged to keep building up defences against Pyongyang. “Our Army has already said that if there will be even the smallest provocation from the United States during exercises, we are ready to deliver the most ruthless blow,” Interfax quoted ambassador Kim Hyong-Jun as saying. “We have the readiness and ability to counter any challenge from the U.S.,” he was quoted as saying. Mr. Trump on Wednesday pledged to Japanese Prime Minister Shinzo Abe that the U.S. would “continue to strengthen its ability to deter and defend itself and its allies with the full range of its military capabilities,” a day after Pyongyang fired a ballistic missile into the Sea of Japan. Shekh Hasina Prime minister of Bangladesh will raise the contentious water sharing issue with prime minister of India. Bangladesh will talk about sharing river water. Bangladesh ministery inform a english newspaper regarding all this. India’s Internet economy is expected to double to $250 billion, according to a report by BCG-TiE. E-commerce and financial services are expected to account for about $40-$50 billion, followed by e-commerce products ($45-$50 billion), private and government infrastructure spending ($50- $60 billion), connectivity ($45-$55 billion), devices ($30-$40 billion) and digital media and advertising ($5-$8 billion). YouTube has stopped placing ads on channels with fewer than 10,000 views in a move aimed at preventing people from making money off offensive or pirated videos. The move came with YouTube striving to derail an ad boycott started by companies worried their brands might be paired with hateful videos at the service, which is part of California-based Google.